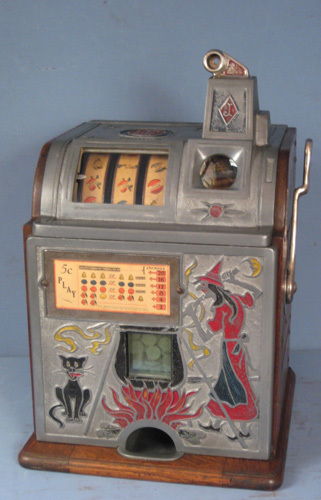 I have two Wizard fortune telling machines I purchased untouched original condition 30 years ago. The first indication to help determine if a machine is a reproduction - look at the interior of the wooden case. The interior will collect some dust or grime and the metals parts will have an aged oxidized appearance, then look at the interior wooden sides, if it has a fresh look, new screws, fresh cut wood and joints, new parts and springs etc. be cautious. Then Turn the machine over and look at the bottom of the case. The bottom should have wear along with dust and grime. Both of my machine cases are painted one blue and other was red. I have seen repos with stained oak wooden cases. A machine with all the concerns I mentioned is most likely a reproduction. Restoring the exterior of a machine is common but not the interior unless there is a major issue or the machine is a reproduction. Furthermore, you may want to contact a fellow collector to provide some measurements of the wooden case because repo aluminum castings will shrink, therefore the wooden case maybe slightly smaller in dimensions to allow for the shrinkage of the castings. Hope this helps. There are other factors but these are the major ones to look for. You or fellow collectors are welcome to contact me with any other machine concerns. I've been a collector since the 1970's. I am not an advocate of reproduction machine or a total restoration unless the machine is damaged. 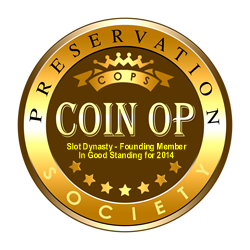 Furthermore, the individuals that reproduce coin operated machines and devices should clearly state by engraving manufacturer's name and the date of manufacture. Moreover, some obscure auction houses are selling reproduction machines. They may not know the difference between an original or reproduction. You may want to call them and ask questions before you buy. Furthermore, please read the online auction platform user agreement. Upon reading it you the buyer may or may not be protected. "BUYER BEWARE". My recent experience. This one auction house said they do not know much about the item because this little old lady dropped them off with no information to be auctioned. This was a red flag. I was burnt!! God Bless American! Drop me a line whether you purchased or not. If you still have your 2 can you tell me the measurements of yours? Did you buy the wizard? if you did then how does the interior wood look, metal etc. That would be the first thing I would examine. As stated above, if a Wizard wood case looks like new, especially on the inside, it is most assuredly a repro. cabinet lock, that was countersunk into the wood. The repros will generally have a standard, cheap cam lock. about any machine that looks too new, before getting Stung.